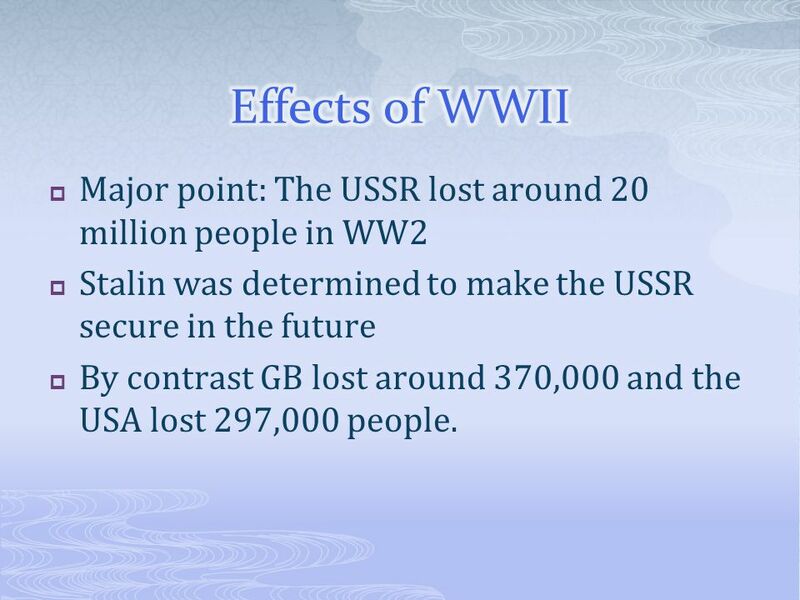 3  Major point: The USSR lost around 20 million people in WW2  Stalin was determined to make the USSR secure in the future  By contrast GB lost around 370,000 and the USA lost 297,000 people. 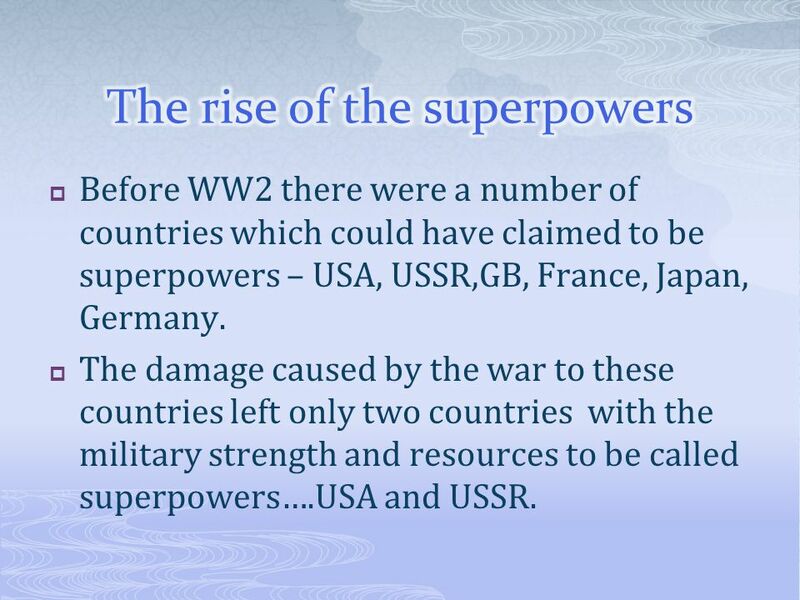 4  Before WW2 there were a number of countries which could have claimed to be superpowers – USA, USSR,GB, France, Japan, Germany. 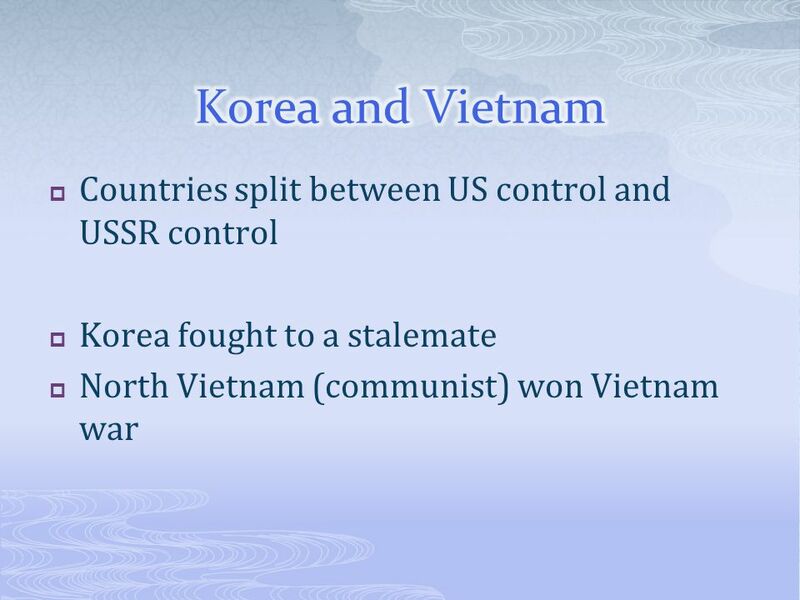  The damage caused by the war to these countries left only two countries with the military strength and resources to be called superpowers….USA and USSR. 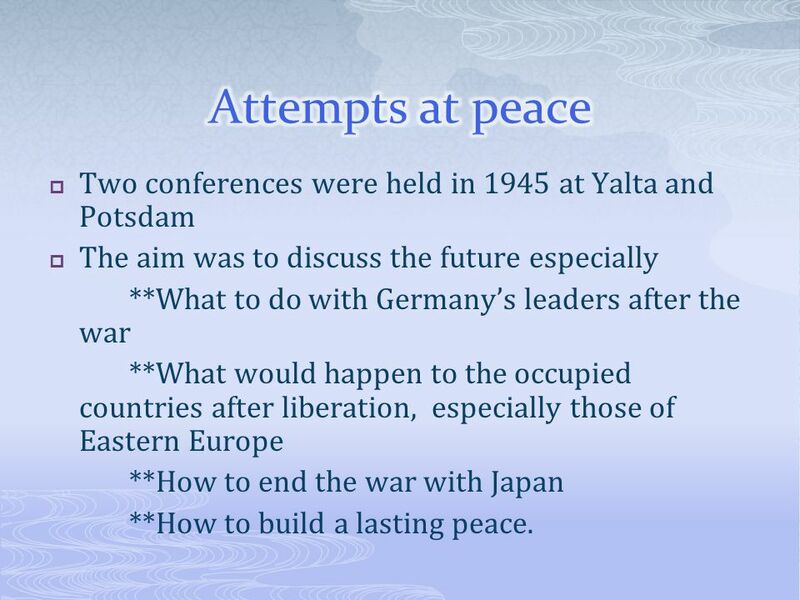 8  Two conferences were held in 1945 at Yalta and Potsdam  The aim was to discuss the future especially **What to do with Germany’s leaders after the war **What would happen to the occupied countries after liberation, especially those of Eastern Europe **How to end the war with Japan **How to build a lasting peace. 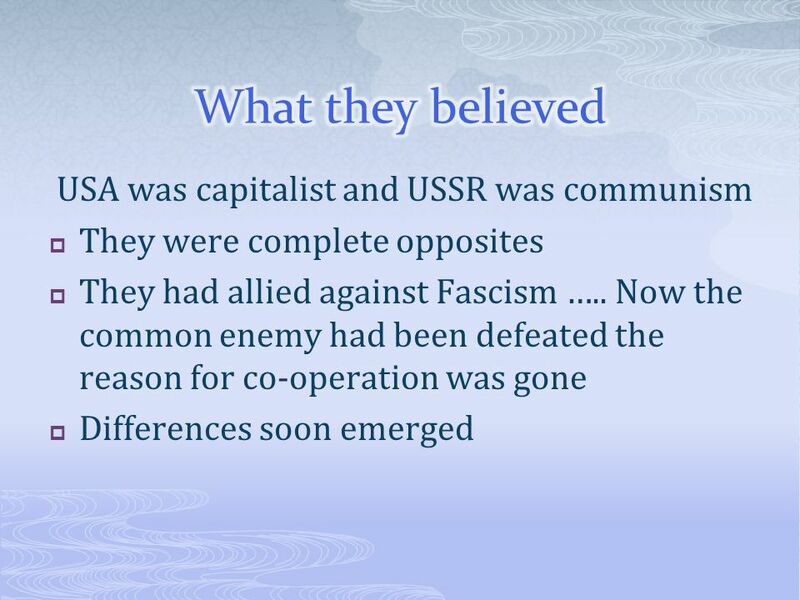 10  Truman had been horrified at the pre-war Allied policy of appeasement and was determined to stand upto any Soviet intimidation. 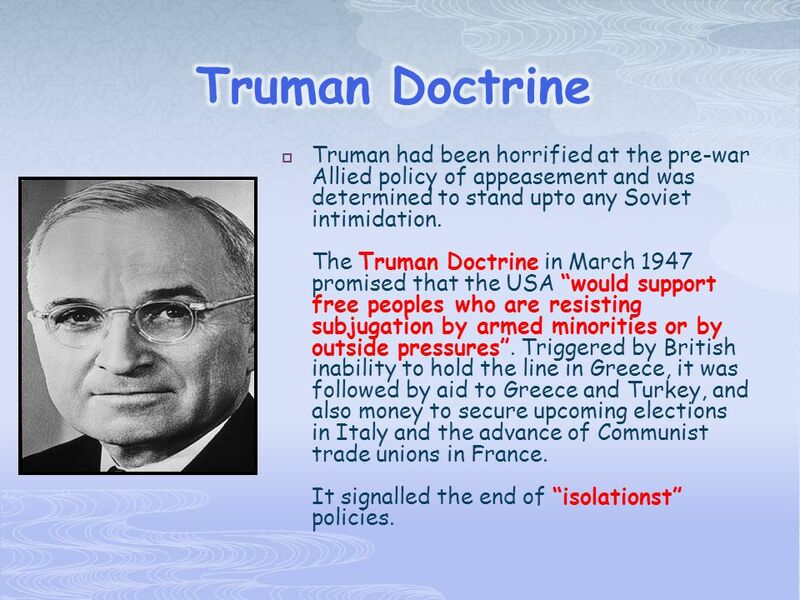 The Truman Doctrine in March 1947 promised that the USA “would support free peoples who are resisting subjugation by armed minorities or by outside pressures”. Triggered by British inability to hold the line in Greece, it was followed by aid to Greece and Turkey, and also money to secure upcoming elections in Italy and the advance of Communist trade unions in France. It signalled the end of “isolationst” policies. 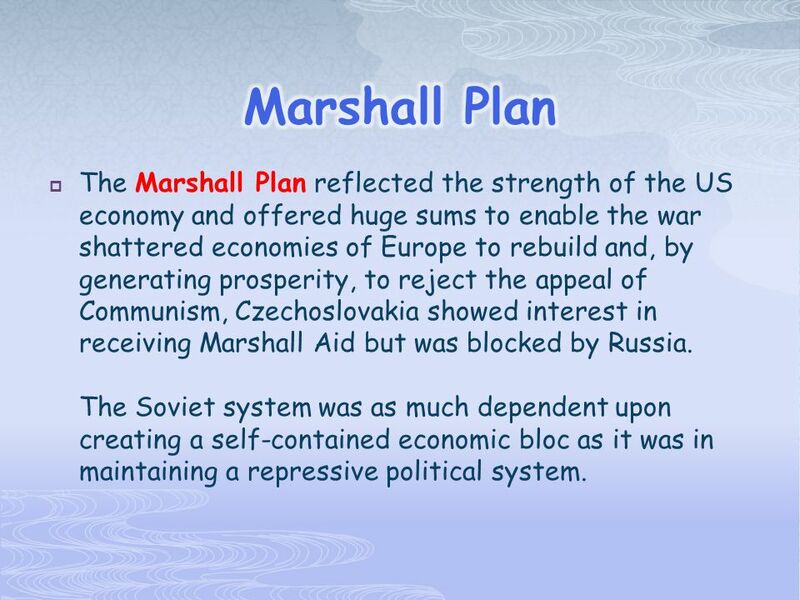 11  The Marshall Plan reflected the strength of the US economy and offered huge sums to enable the war shattered economies of Europe to rebuild and, by generating prosperity, to reject the appeal of Communism, Czechoslovakia showed interest in receiving Marshall Aid but was blocked by Russia. The Soviet system was as much dependent upon creating a self-contained economic bloc as it was in maintaining a repressive political system. 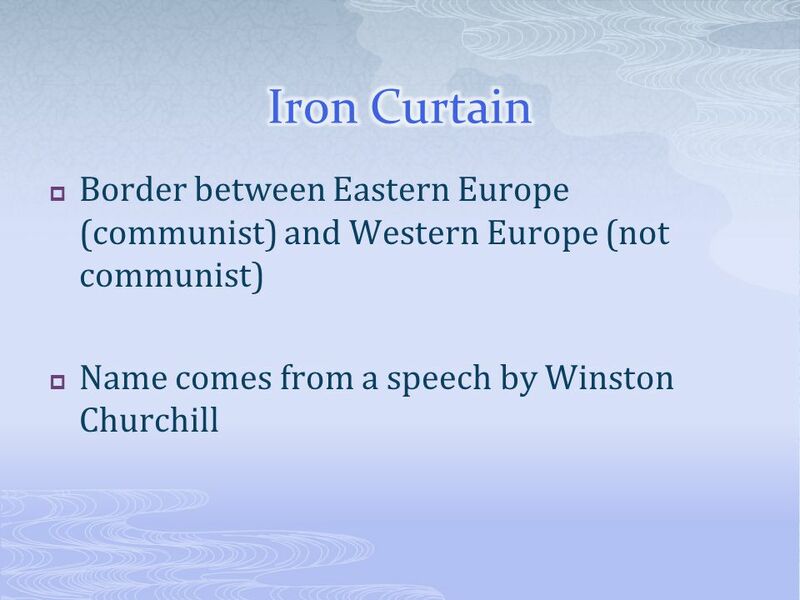 12 Iron Curtain – A term used by Winston Churchill to describe the separating of Those communist lands of East Europe from the West. 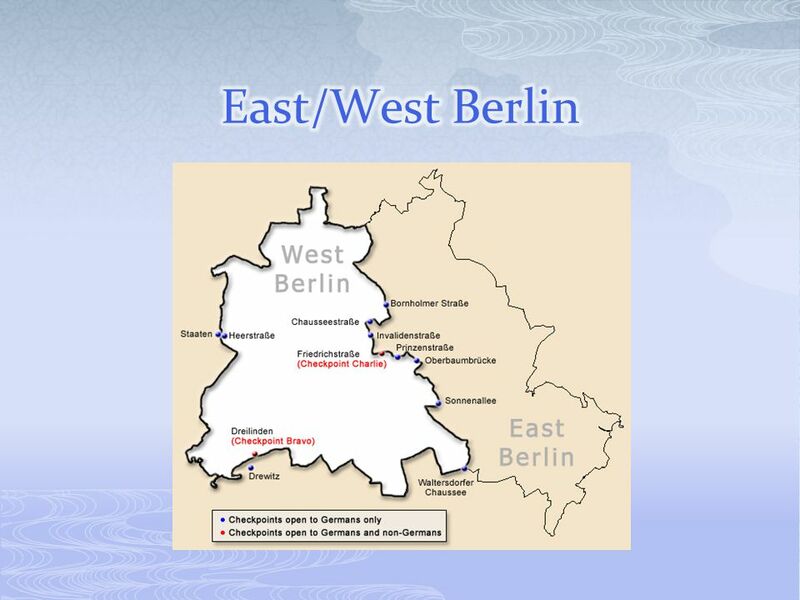 13  The Russians took very high casualties to capture Berlin in May 1945. 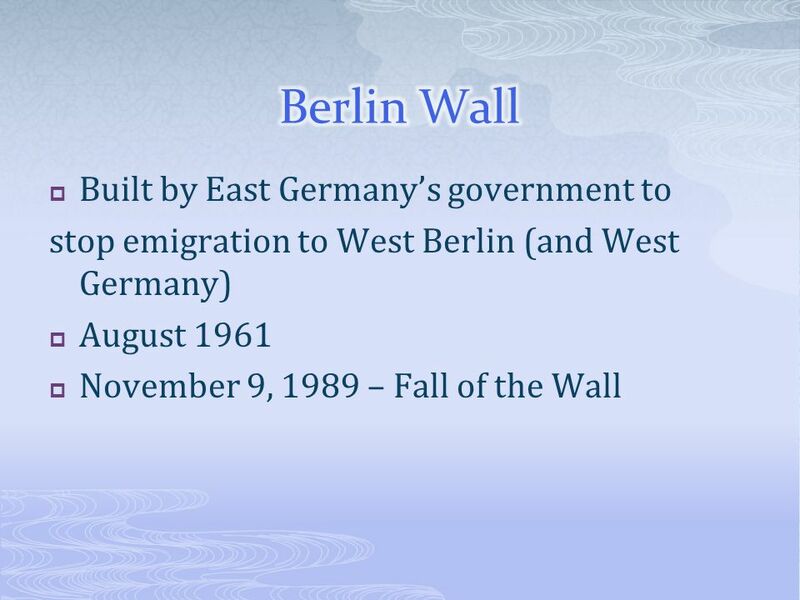 They spent the early occupation trying to take over all zones of the city but were stopped by German democrats such as Willy Brandt and Konrad Adenauer. 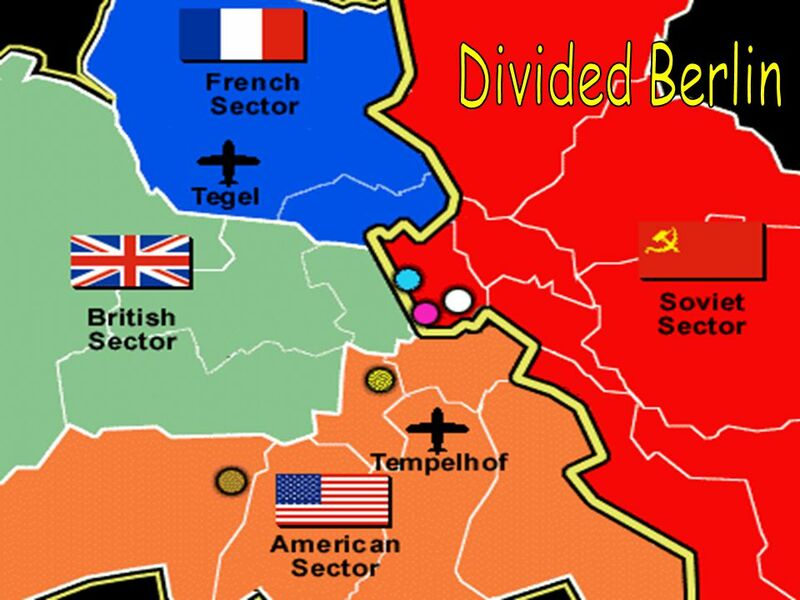 Reluctantly the Russians had to admit the Americans, French and British to their respective zones. 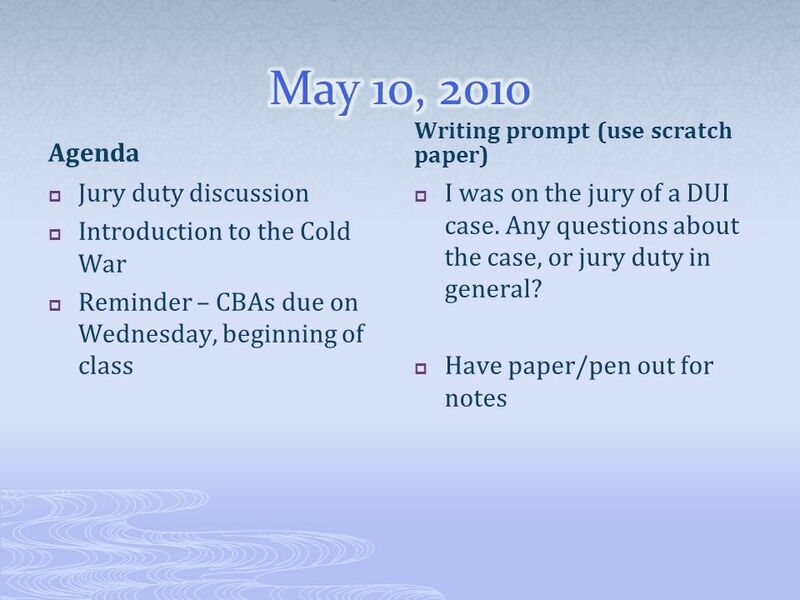 Download ppt "Agenda  Jury duty discussion  Introduction to the Cold War  Reminder – CBAs due on Wednesday, beginning of class Writing prompt (use scratch paper)"
Berlin: It’s got problems Objective: Analyze America’s response to the Berlin Blockade Std c.
Origins of the Cold War By the 1970s the US and the USSR each had enough nuclear weapons to blow the world up several times over. 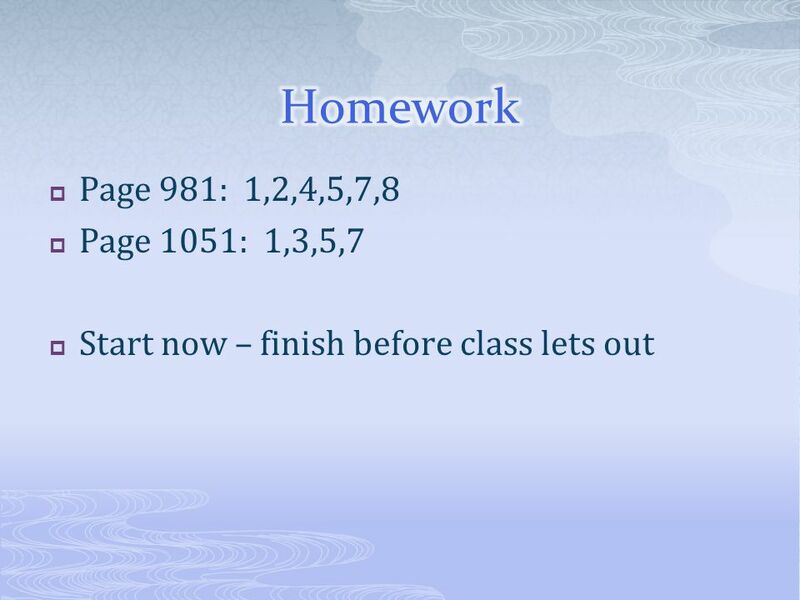 Can you explain this. 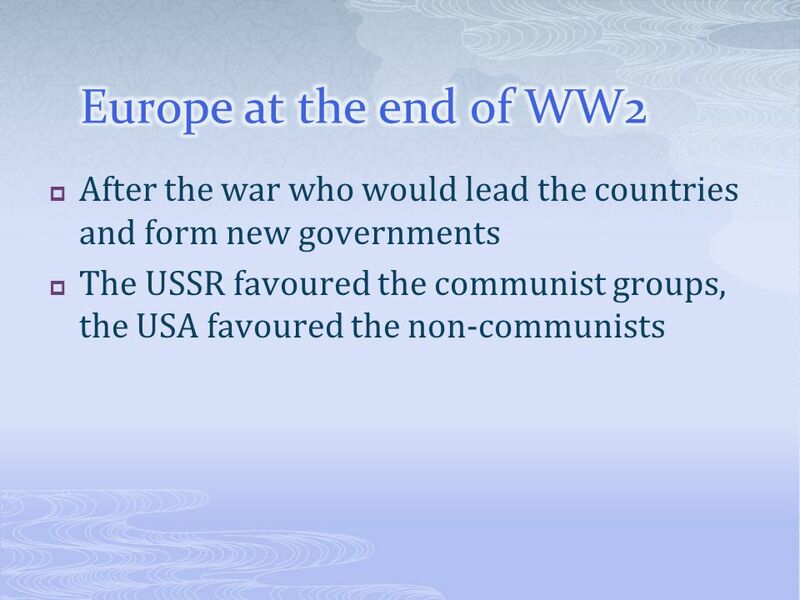 How did both, capitalist and communist, coexist after World War 2? 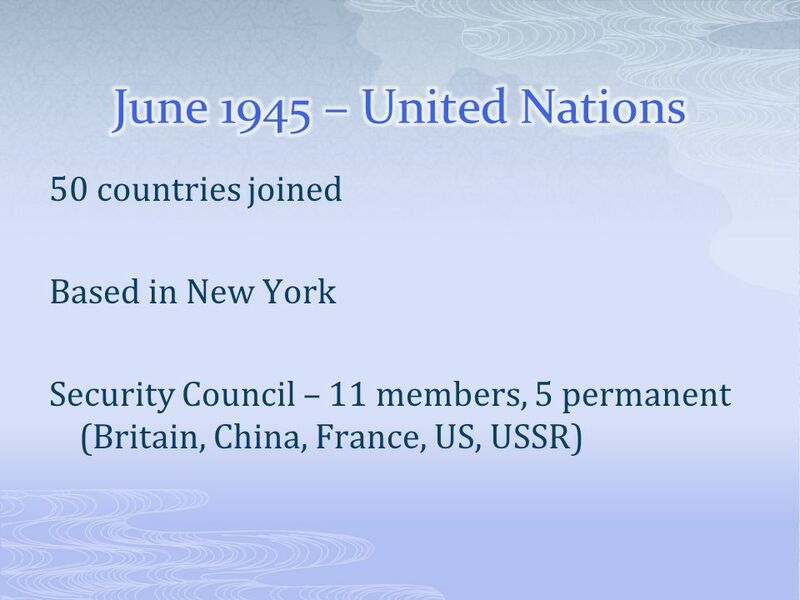 1.The World After World War 2 -Yalta Conference -United Nations -Growing resistance. 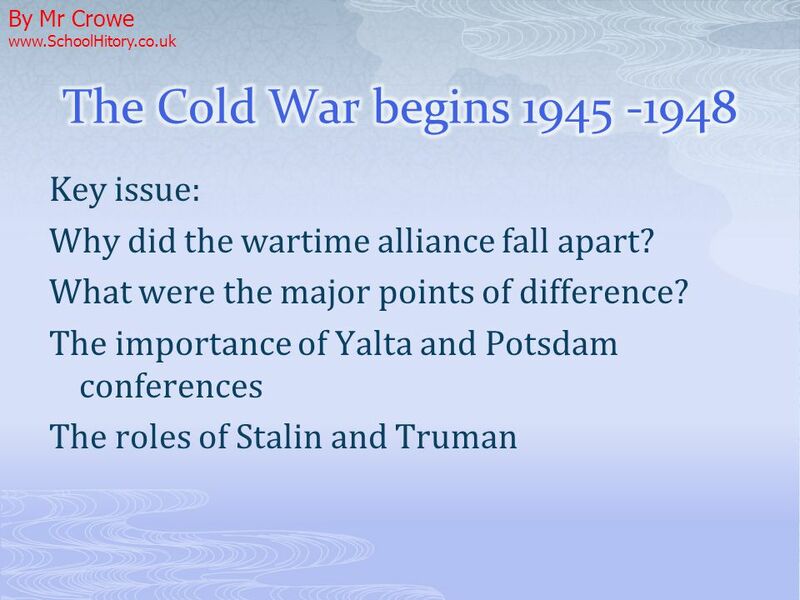 Origins of the Cold War 1945 to 1950. 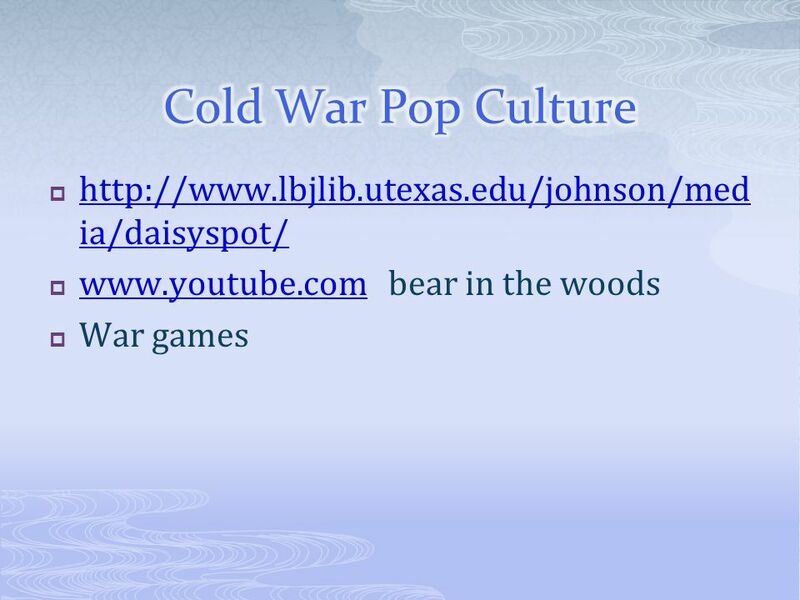 Chapter 26 The Cold War. 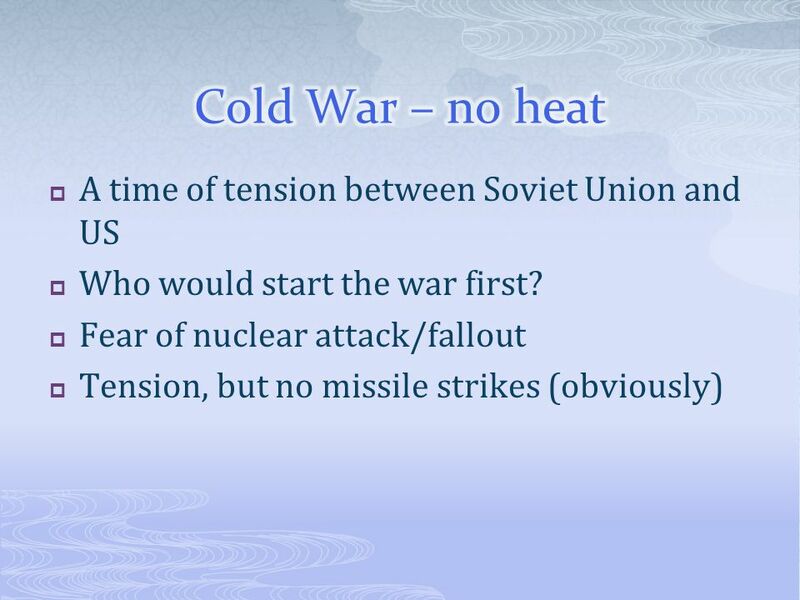 1 The Cold War US vs. Union of Soviet Socialist Republics Democracy vs. 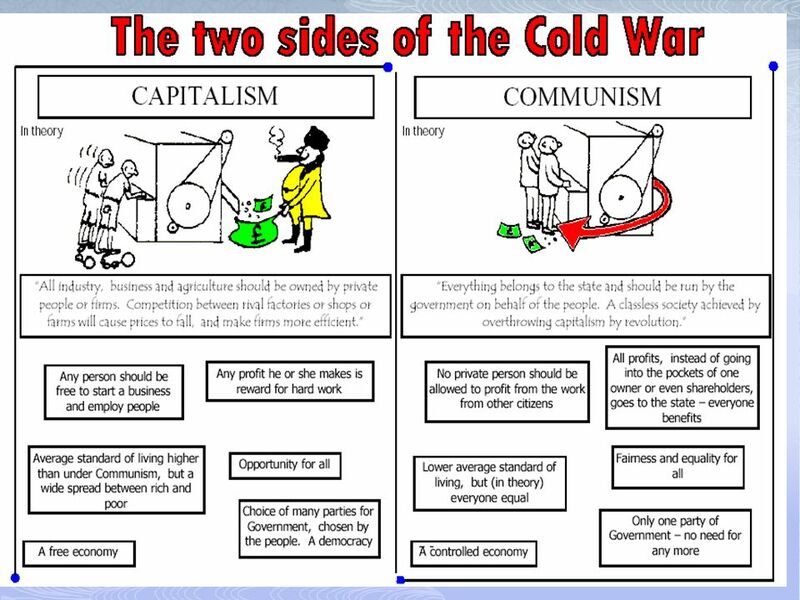 Communism Capitalism vs. Socialism. 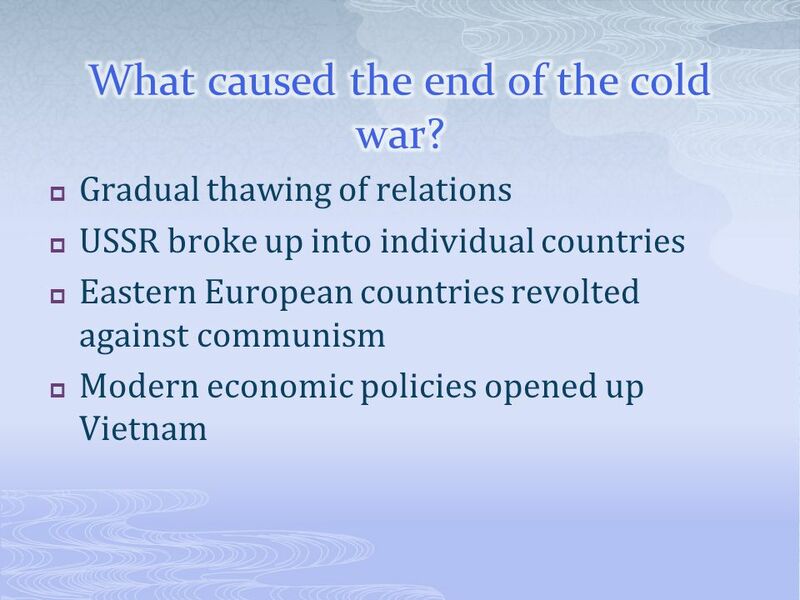 Global: 4/17/2015 I/O: To examine and discuss the key events that mark the start of the Cold War Key Question: How did the end of WWII, and the territorial. 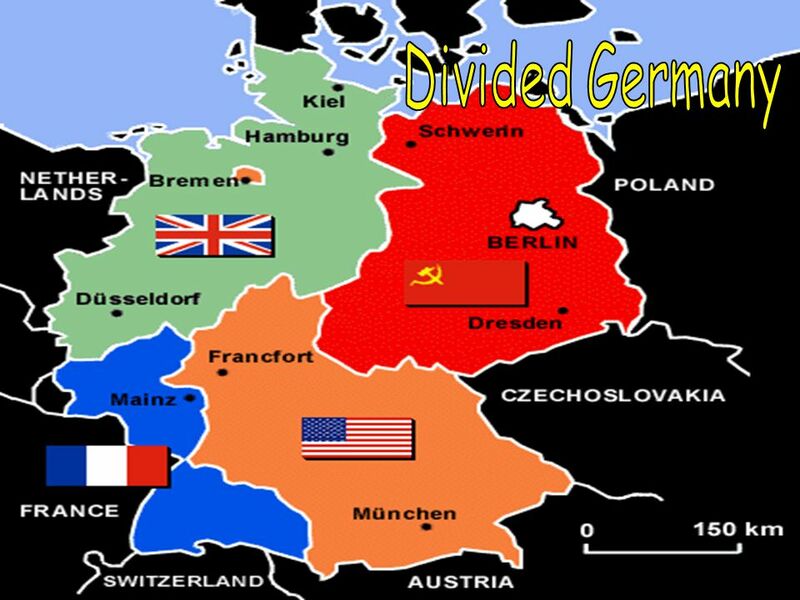 Vocabulary II.8a 1.Iron Curtain: political divide separating Soviet- dominated Eastern Europe and U.S.-led Western Europe 2.Marshall Plan: Gen. George.